I ate this dish at my father in law's house several times and he emailed me the recipe. This is currently my favorite meal to cook and eat. I make it once a week and besides being extremely easy, it is so tasty. My father in law makes it better than I do but each time I try it gets better. 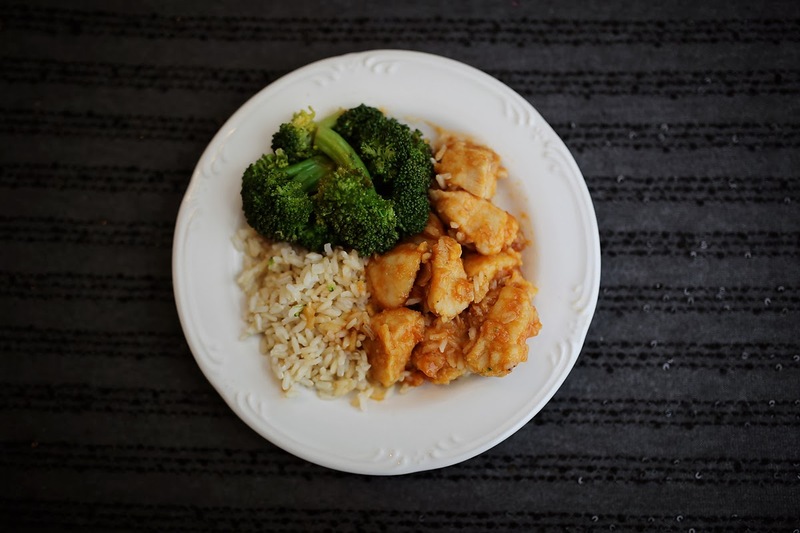 I don't know the original source of the recipe but please try making it, because it really is delicious and is a good alternative to Chinese take out. Preheat oven to 325 degrees. Rinse chicken breasts, pat dry, and cut into cubes. Season with salt and pepper. Dip into cornstarch to coat and then dip into eggs. Heat oil in a large skillet and cook chicken until browned but not cooked through. Place the chicken in a 9x13 baking dish. You can grease it but I have always skipped the grease. Mix the sauce ingredients with a whisk. I double or triple the measurements because I don't like the chicken to get dried out and I also like extra sauce for rice and broccoli. Pour mixture evenly over the chicken and bake for one hour. I set the timer to turn the chicken every 15 minutes. After I get the chicken in the oven, I set the rice cooker up with some brown rice and then add the broccoli toward the end of the steaming cycle. Did you know that soy sauce has gluten in it? I made this tonight. It was incredible!! I used GF soy sauce and omitted the garlic sauce because I couldn't find GF. I used garkic powder instead. It really was delicious! A crowd pleaser. I will soooo be making it again. Thanks for sharing!